The intricate details from this image are the gems of the Candlelight Farms Inn Wedding Photos. 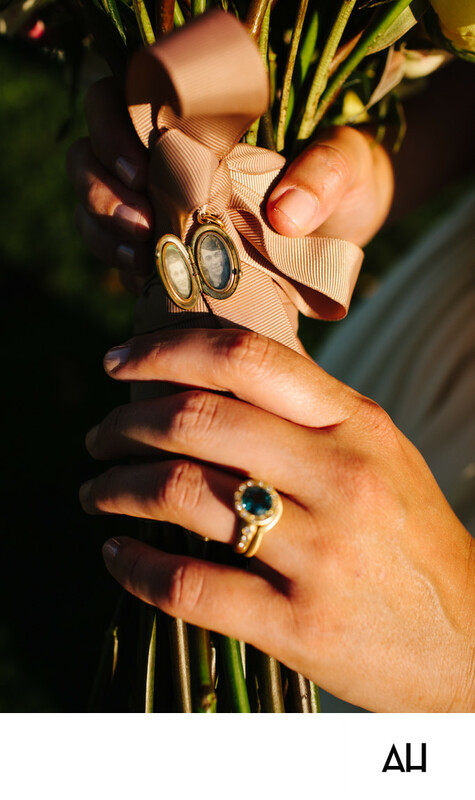 The locket on the bride’s bouquet holds a symbol of faithfulness, love, and family. The image is of the bride’s grandparents. As individuals and as a couple, these two people have provided the bride with a model of what an honest, loving marriage can be. In the spirit of their faithfulness and in remembrance of their lives, the bride found it only fitting to have them close to her heart as she made her own journey down the aisle to her own forever love. Also notable in this photo, and in other Candlelight Farms Inn Wedding Photos from this wedding, is the bride’s unique ring. In place of a traditional center diamond is a beautiful green emerald. The band of the ring is lined with tiny diamonds, as is the halo around the emerald. The focus on these two details tell a great deal about the bride and demonstrate aspects of her personality and values that one would not know just from looking at her face on her wedding day. The image of the ring shows her as a unique individual, and the locket demonstrates the importance of devoted love and family on her special day.